Michael Emmet Walsh (born March 22, 1935) is an American character actor and comedian who has appeared in over 200 films and television series. He appeared in the Coen Brothers' first film, Blood Simple (1984). He also appeared in such other films as Carl Reiner's comedy The Jerk (1979), Robert Redford's drama Ordinary People (1980), Ridley Scott's science fiction film Blade Runner (1982), Barry Sonnenfeld's steampunk western Wild Wild West (1999) and Brad Bird's animated film The Iron Giant (1999). Walsh was born in Ogdensburg, New York, the son of Agnes Katharine (née Sullivan) and Harry Maurice Walsh Sr., a customs agent. He is of Irish descent. He was raised in rural Swanton, Vermont, and attended Clarkson University. He graduated in 1958 (B.A., Business Administration). In 1998, the Clarkson Alumni Association presented him with the Golden Knight Award. Walsh came to prominence in the 1978 crime film Straight Time, in which he played a parole officer. He also had a small but memorable role as a crazed sniper in the Steve Martin comedy The Jerk. One of his best-known roles was Captain Harry Bryant in Ridley Scott's cult film Blade Runner. His most acclaimed performance was arguably the double-crossing private detective in Blood Simple (1984), for which he won the 1986 Independent Spirit Award for Best Male Lead. Walsh made occasional guest appearances on Home Improvement as Tim Taylor's father-in-law. In 1992, he appeared as a powerful U.S. Senator in David Winning's Killer Image. In Christmas with the Kranks, he played one of the Kranks' neighbors. He also appeared as Alex Lembeck, a motorcycle cop who appointed himself as Sandy Stockton's chaperone and protector on The Sandy Duncan Show in 1972. He appeared in an episode of the NBC drama series Gibbsville in 1976 and Little House on the Prairie in 1981. In comedy, Walsh played the cynical small town sportswriter Dickie Dunn in the iconic 1977 hockey film Slap Shot, and a college diving coach in the Rodney Dangerfield film Back to School. 1987 Harry and the Hendersons George Henderson Sr.
1969 N.Y.P.D. Unknown character Episode: "Who's Got the Bundle?" 1970 Arnie Cliff Episode: "To Buy or Not to Buy?" 1971 All in the Family Billy Hartfield Episode: "The Saga of Cousin Oscar"
1971 The Jimmy Stewart Show Lionel Atkins Episode: "Another Day, Another Scholar"
1971 Ironside Telegraph Clerk Episode: "Dear Fran..."
1971 Bonanza Mattheson Episode: "Warbonnet"
1972 The Don Rickles Show Kingston Episode: "Episode Four"
1972 The Bob Newhart Show Jack Hoover Episode: "P-I-L-O-T"
1974 McMillan & Wife Officer Ames Episode: "Buried Alive"
1974 Amy Prentiss Tom Episode: "Baptism of Fire"
1975 The Rockford Files Edgar Burch Episode: "Counter Gambit"
1975 The Waltons David Fletcher Episode: "The Venture"
1976 Gibbsville Yostie Episode: "Afternoon Waltz"
1978 James at 15 Coach Federson Episode: "Queen of the Silver Dollar"
1979 Dear Detective Capt. Gorcey Episode: "Pilot"
1980 Skag Moran Episode: "Pilot"
1981 Little House on the Prairie Callahan Episode: "Chicago"
1983 ABC Afterschool Special Joe Lempke Episode: "The Woman Who Willed a Miracle"
1984 AfterMASH Samuel Lynn Episode: "The Case of the People of Florida vs. Joseph Landrum"
1985 ABC Weekend Special Rocco Episode: "The Adventures of Con Sawyer and Hucklemary Finn"
1985 The Twilight Zone Peter Episode: "Dealer's Choice"
1986 The Hitchhiker Detective Underhill Episode: "Ghostwriter"
1986 The Disney Sunday Movie General Presser Episode: "Hero in the Family"
1986 Amazing Stories Grandpa Episode: "Magic Saturday"
1989 Tales from the Crypt Jonas Episode: "Collection Completed"
1993 The Jackie Thomas Show Arlen Thomas Episode: "Aloha, Io-wahu"
1996 The Outer Limits Sanford Vallé Episode: "The Refuge"
1996 Early Edition Santa Episode: "Christmas"
1998 Tracey Takes On... Jimmy Duff Episode: "Sports"
1999 The X-Files Arthur Dales Episode: "The Unnatural"
1999 The Wild Thornberrys Gemsbok #1 (voice) Episode: "Rain Dance"
2000 NYPD Blue Joe Kroft Episode: "Roll Out the Barrel"
2000 Cover Me: Based on the True Life of an FBI Family Aubrey Lang Episode: "The Book of Danny"
2000 Ed Mayor Wally Kendricks Episode: "Home Is Where the Ducks Are"
2001 Gideon's Crossing Dr. Matthews Episode: "A Routine Case"
2001 Night Visions Gus Episode: "Reunion"
2001 Frasier Rich Koechner Episode: "Bully for Martin"
2002 What's New, Scooby-Doo? Jeb (voice) Episode: "Scooby-Doo Christmas"
2003 Charlie Lawrence Cubby Episode: "New Kid in School"
2003 The Guardian Ezra Pence Episode: "Big Coal"
2010 'Til Death Uncle Rudolph Episode: "Let's Go"
2012 Army Wives Bernie Wallacheck Episode: "Battle Scars"
2014 Tim and Eric's Bedtime Stories Detective Episode: "Toes"
2015 Empire Harold Blakeley Episode: "The Lyon's Roar"
^ "Top 25 Character Actors". Digital Polyphony. ^ "M. Emmet Walsh profile at". Filmreference.com. Retrieved May 22, 2018. ^ Jacobs, Alex (July 12, 2008). "Walsh marks 50-year reunion". Watertown Daily Times. ^ Jacobs, Alex (2008-07-12). "Walsh marks 50-year reunion". WatertownDailyTimes.com. Retrieved 2009-03-27. ^ "M.Emmet Walsh of Culver City, Calif. And Swanton, Vermont, Receives Clarkson University's Highest Alumni Honor". Clarkson University. August 21, 1998. Retrieved August 9, 2016. ^ "Little House on the Prairie Season 8 Episode 8 Chicago". TV.com. Retrieved July 29, 2016. 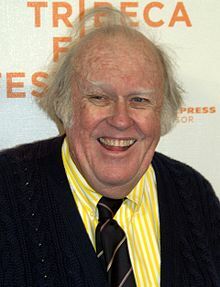 Wikimedia Commons has media related to M. Emmet Walsh.